Aside from the principal achievement of wide community participation, these joint meetings resulted in a better program since many valuable additions were made at the suggestion of organizations other than the League. Implementing the program 1) Distribution of material. Various agencies and business organizations were asked to distribute fliers. They submitted estimates of number of copies needed. Pamphlets were also needed for doctor's offices and beauty parlors, other material for information booths. A survey of all available material was made, the League of Women Voters, 726 Jackson Place, Washington, D.C. and the National Committee on Atomic Information, 1749 L Street N.W., Washington, D.C. being the main sources although various magazines containing articles and reprints of same were included in master list. Quality of material was found to be excellent; the quantity was insufficient. By supplementing available material with a leaflet written and printed locally, above requisits were filled but, in many cases, not adequately as to amount. With several city wide distributions, variety is, of course, a paramount necessity. 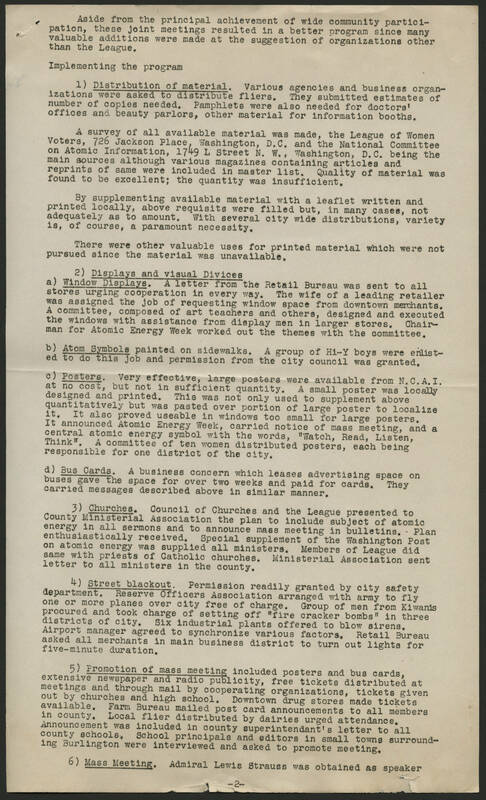 There were other valuable uses for printed material which were not pursued since the material was unavailable. 2) Displays and visual Divices a) Window Displays. A letter from the Retail Bureau was sent to all stores urging cooperation in every way. The wife of a leading retailer was assigned the job of requesting window space from downtown merchants. A committee, composed of art teachers and others, designed and executed the windows with assistance from display men in larger stores. Chairman for Atomic Energy Week worked out the themes with the committee. b) Atom Symbols painted on sidewalks. A group of Hi-Y boys were enlisted to do this job and permission from the city council was granted. c) Posters. Very effective, large posters were available from N.C.A.I. at no cost, but not in sufficient quantity. A small poster was locally designed and printed. This was not only used to supplement above quantitatively but was pasted over portion of large poster to localize it. It also proved useable in windows too small for large posters. It announced Atomic Energy Week, carried notice of mass meeting, and a central atomic energy symbol with the words, "Watch, Read, Listen, Think". A committee of ten women distributed posters, each being responsible for one district of the city. d) Bus Cards.